The days here in Minnesota are turning fall-like. Slightly cooler temps. The skies are flipping back and forth from brilliant blue and cloudless to grey and ominous looking. Most of the trees in the yard are bare. Piles of orange, yellow and red leaves are scattered across the lawn. That smell-the smell of turning leaves and crisp air hang all around me. Taking deep breaths, I fill my lungs with that wonderful smell of autumn. It is absolutely my favorite time of the year. We are very fortunate to live someplace that experiences all four seasons of Mother Nature's calendar. But I love fall most of all. The clean air, the changing color of the sky, the crunching leaves underfoot. My parent's families are very different. My Mom had a larger family-all girls. She had four sisters. There are 21 grandchildren, 50 something great-grandchildren and numerous great-great grandchildren (although now all four of my grandparents have passed away). My Dad has two brothers. It is hard to explain, but I have two sisters and a brother, but I am my Dad's only biological child. Because of this, there are 5 grandchildren to my paternal side. I am the only girl. 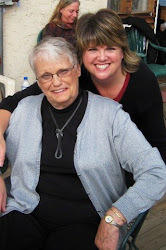 I have several girl cousins on my Mom's side, but I wasn't close to them as most of them were 4 to 18 years older than I. I am pretty close to my cousins on my Dad's side, but I longed for girl cousins there. My prayers were answered over the course of 10 years when each of my cousins married wonderful women. 1990 had a busy summer as three of us got married. I cherish all four of the beautiful women my cousins brought to my life. I waited a long time for them to get here! All of us know our way around a kitchen. Maybe not fancy-schmancy food, but we can all put a satisfying, hot meal in the bellies of our men and children. My cousin (in-law) Geri brought this hotdish (in Minnesota it is a hotdish, not a casserole!) to one of our Cousin Christmas parties and holy moly, it is good. I do not like stuffing at all (please don't eyeball me like that). I prefer straight up turkey, mashed potatoes with butter, corn, rolls, jellied cranberries (again with the eyeballing me?) and my aunt's lime Jell-o with applesauce and 7 Up. 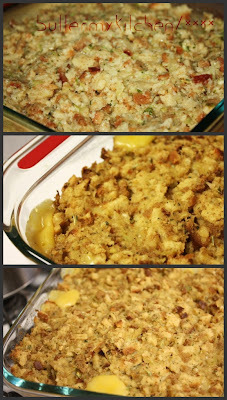 However, when you bake stuffing on top of this hotdish, and it gets all crunchy? Oh my word, it is heavenly. Preheat oven to 350 degrees F. Boil chicken and cut up into small pieces. Put chicken pieces into a greased 9x13 inch pan. Mix soups and milk and pour over chicken. Melt butter in saucepan. Saute veggies for a few minutes then add chicken broth. Bring to a boil. Stir in stuffing mix and turn off heat. Stir to moisten all the stuffing. Let sit for a couple of minutes so all liquid is absorbed. Pour over the top of the soup layer. Bake for 45 to 60 minutes. I picked all the crispy bits off the side of the pan before putting it into the sink to wash. It was heaven. Wow do you have a big family! I'm an old child but have cousins I am very close to. Have three boys and they have helped expand our family! That chicken dish is exactly my type of food. It's a keeper! I meant to type only child!!!! LOL, okay-but I did laugh at 'old'! Mmmm. It sounds so creamy and delicious. I love the crunchy stuffing on top. I adore dishes like this. 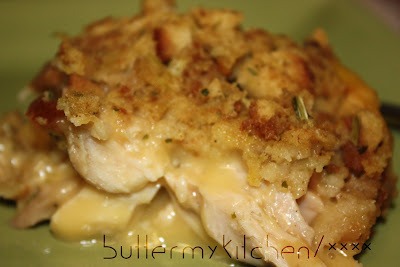 I have a similar one that calls for only 5 ingredients, the chicken, swiss cheese slices, cream mushroom soup, melted butter(bottom of pan) and stuffing, premade first and cooled. Cooked layered.. so f&*ng good. This is so up my alley!!! I would love this!!! !